Your trendy and powerful accessory. Prestigio, an international manufacturer of mobile devices, consumer electronics and accessories known in 85 countries, announces the release of its new camera phone with octa core processor, 2 GB RAM and IPS on-cell display – Prestigio Muze A7. “In the epoch of informatization the speed is the main feature which is important for up-to-date devices. The faster we get what we need – the more useful the smartphone is in our everyday life. I am proud that Prestigio moves with the times and is always capable to respond to users and deliver the most effective modern devices! 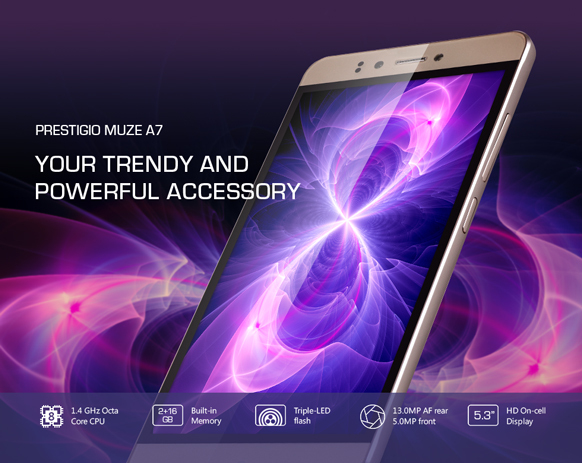 And the latest one is the Prestigio Muze A7! Thanks to octa core processor, our new smartphone allows its user to meet all the challenges a modern society can propose - and to succeed in seconds! Progressive processor is supported with 2 GB RAM so almost any task is possible to complete. For sure, we added other outstanding specifications in addition to powerful filling – create beautiful content with 13 MP (rear) and 5 MP (front) cameras, watch them on stunning 5.3” HD (720 x 1280) IPS On-cell display, enjoy Dual SIM support and just love the way your device looks – different colour schemes are proposed to stress your personal style!” - Anton Volchenkov, Chief Commercial Officer, Prestigio EMEA, on the Muze A7 release. For sure, the main thing about the Muze A7 is its outstanding productivity. 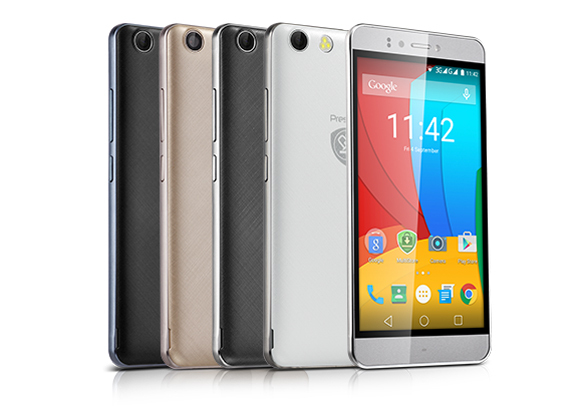 A powerful octa core processor is the new step – and it makes this smartphone a truly TOP device not only in a Prestigio Muze product line, but on the whole market. Combined with 2 GB RAM, It allows you to manage all the types of tasks – from the extra fast browsing to modern games on the highest settings, watching online movies in HD quality and editing huge files. Most importantly, the user can enjoy multitasking by launching several applications at a time and switching between them. For quality content, a high specification display is needed. The phone features one of the best screens you can imagine. 5.3 inches wideness makes gaming, watching movies and even regular browsing or working with documents more convenient and enjoyable. High definition (720 x 1280), IPS & on-cell technology guarantee that you will never miss a thing, watching HD movies and playing picturesque games will treat your eyes. The Muze A7 possesses outstanding cameras to create content and to keep in touch with your friends and family when away. Try the 13.0 MP rear camera with triple LED-flash for shooting photos and movies – and imagine yourself as a real filmmaker or a professional photographer. Take beautiful selfies with 5.0 MP front camera, post them onto social networks and get lots of likes and followers. Of course, now you get an extra bonus – all the video calls you make will allow your family and friend to see you with a quality picture! The powerful hardware is boosted by a much-loved Android 5.1, which is preinstalled in the Prestigio Muze A7 right from the box. So the smartphone is even more powerful! The Material Design is responsible for high usability and a great appearance. You get an access to millions of application in Google Play Market and are able to get all the latest updates. The Muze A7 is shipped with 16 GB of internal storage on board. It is the most popular volume for smartphones. But if the user wants to enlarge it to store more files it is possible to do so with a microSD card up to 32 GB. Popular cloud storages can make the volume almost endless. For money conscious people Dual SIM support is provided. Engaging 2 different tariffs for calls and Internet or to stay in touch with the entire contact list regardless of mobile operator saves money and makes device even more effective. The Muze A7 is not only a powerful and modern device – it is also a perfect accessory that can stress the style. Choose between different colour schemes – clear white, fabulous gold, elegant grey or classical black – and complete your image. Despite the wideness of the screen, the Muze A7 is quiet compact and convenient to operate even with one hand. So, it will be a great choice for a serious businessman or a stylish young girl with tiny hands. Of course, all this stunning content goes hand in hand with Prestigio corporate feature – the price is fair and affordable.